It’s serendipity, I suppose. Just as I was preparing to review a DSD download of Shostakovich’s Eleventh Symphony (LSO/Mstislav Rostropovich) the work was featured on BBC Radio 3’s Building a Library. 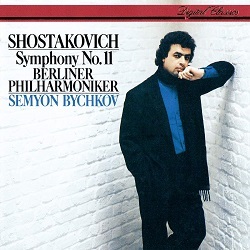 The top choice was Semyon Bychkov’s performance with the Berlner Philharmoniker; his brother Yakov Kreizberg’s Stuttgart one was one of the runners-up. This is Bychkov’s first recording of the piece; alas, his second, with the WDR SO, was very disappointing (Avie). These were also Kreizberg’s earlier thoughts on the symphony; his Monte Carlo remake only received a qualified welcome from Brian Reinhart (OPMC Classics). While this is a belated review of two performances I’ve not heard before, it’s also a chance to follow up on my delayed discovery of the talented Mr Kreizberg, who died in 2010 at the age of 51. I was deeply impressed by his Pentatone recordings of Strauss waltzes and the Bruckner Seventh, both with the Wiener Symphoniker. Indeed, such is the musical and technical excellence of the latter, that I simply had to make it a Recording of the Month. Now, the elite Berlin Phil aren’t an obvious choice in this repertoire – ditto Herbert von Karajan – but they recorded two splendid accounts of Shostakovich’s Tenth for Deutsche Grammophon (1967 and 1981). There’s also a live Moscow performance from 1969 that, despite the occasional fluff, is one of the most intense, unflinching versions I know. A must-have, if you can find it. Then, in 2011, Yutaka Sado and the BP featured in a similarly powerful video of the Fifth, which, at times, reminds me of Leonard Bernstein at his early best (Euroarts). Bychkov recorded that symphony with the Berliners in 1986; that deleted Philips release is now available as a download or as a special-order CD from Presto. What about the Eleventh itself? Like No. 7 (‘Leningrad’) and No 12 (‘1917’), it has a direct appeal that’s often dismissed as little more than film music. Focused on the failed revolution of 1905, the piece does invite a filmic tag; that said, conductors have discovered that behind these alarums and excursions lurks a score of immense vitality and power. In my review of Dmitri Kitaienko’s recording – part of his Capriccio set – I suggested that he and Mark Wigglesworth on BIS – BaL’s joint runner-up – have done much to rehabilitate this long-derided symphony. Ironically, though, it was the perceived populism of the piece that earned Shostakovich a Lenin Prize in 1958. There are some aspects of Bychkov’s Berlin Fifth that bode well for his Eleventh, recorded a year later, and some that don’t. On the upside, he shapes and builds the music well; he doesn’t dawdle, either, and that makes for a crisp and fairly propulsive performance. Also, he’s not without feeling, especially in the haunting – and haunted – Largo. As expected, the playing is very polished, if not terribly idiomatic. (Kurt Sanderling’s 1982 account with the Berlin Symphony sounds far more ‘authentic’.) The downside is that Bychkov’s delivery isn’t always as seamless as I’d like, and there are stretches in the finale where the music drags and odd tempo changes disrupt essential flow. As for the Philips recording, it’s decidedly average. Of course, sound quality doesn’t take precedence over the performance itself, but, as Wigglesworth’s Eleventh so amply demonstrates, superior sonics add considerably to the impact of the piece. And while Bychkov’s BP recording isn’t in that league, it’s far more involving than that provided for his Fifth. Indeed, the atmospheric Adagio (‘The Palace Square’) bristles with added menace, the timps especially well caught. Also, there’s a wealth of colour and detail that underlines the quality of Shostakovich’s writing here. Even at this early stage, it’s clear this performance surpasses his Avie one, not least in terms of imagination, thrust and overall impact. Particularly important is the fact that, along with Kitaienko and Wigglesworth, Bychkov gives the piece a truly symphonic feel. As for the BP, they play with formidable commitment and, in ‘The 9th of January’, with thrilling unanimity and edge. Goodness, that vicious side-drum and those tam-tam smashes are a knockout – as they should be – and the slow pan across the field of battle is simply devastating. Indeed, the Berliners’ magnificent, sorrowing strings in the third movement, ‘In memoriam’, serve to remind us of how often grief and ghosts haunt these symphonies. Bychkov’s crisp, cleanly articulated approach to this music, a feature of his Fifth, is most welcome in his febrile and increasingly visceral response to ‘Tocsin’, the work’s overwhelming finale. This section, so easy to overdrive – and trivialise – is delivered with all the punch and power it requires. Bychkov builds towards that epic coda far more effectively than he does in his later account. And while the bells aren’t as prominent as some, the terrific bass drum and tam-tam more than make up for that. No faux hysteria or empty triumphalism here, just superb music-making. 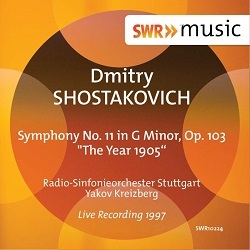 Well, I now see why BaL reviewer and Shostakovich authority Gerard McBurney prefers this recording of ‘The Year 1905’ to all others. But before we move on to Kreizberg’s Stuttgart performance, a few words about his Monte Carlo one. That scene-setting Adagio is just too refined and relaxed, damningly so after the cumulative tension and raw energy of Bychkov in Berlin. The warm, slightly diffuse sound doesn’t help. Even more injurious, the battle’s aftermath and ‘In memoriam’ convey little or nothing of the bone-chilling bleakness that his brother finds there. And although the finale is well played, it doesn’t come anywhere near the best in terms of urgency and excitement. Tintinnabulists will be disappointed, too. Bychkov didn’t get it right the second time, so perhaps the same applies to his brother. The first movement of Kreizberg/Stuttgart, recorded live in 1997, is certainly encouraging. There’s a brooding intensity here that’s missing in Monte Carlo; also, the quality of ensemble and sound is much better. Most important, there’s a darkly elegiac quality to this opener – what gorgeous cellos and basses – that I like very much indeed. Not quite as gripping as Bychkov/Berlin, but pretty compelling nonetheless. The clear, natural sound, with commendable presence, suits the music very well indeed. In fact, the more I heard of this performance, the more I came to admire it. Telling details and striking sonorities, skated over in 2010, are here in abundance. Live recordings don’t always convey that electric sense of occasion; this one most certainly does. And while the weight and amplitude of the BP in the battle scene is hard to beat, these sensational Stuttgarters run them very, very close. The drums and tam-tam, superbly rendered, add real frisson to the mix. Not only that, I’d say Kreizberg’s ‘In memoriam’ is even more penetrating than his brother’s. As you may have gathered, this is an exceptional performance, light years away from the safe, almost anodyne Monte Carlo one. I was also struck by the commitment and character of this radio band, the playing – individually and collectively – as poised and passionate as one could wish. This all feeds into a finale of remarkable strength and sinew. The well-balanced recording, with decent depth and spread, really pays dividends here. True, it’s not in the BIS class, but it is scruff-grabbing, and that’s what counts. Now, if only I’d been able to hear the bells at the end, my pleasure would have been complete. So, two very fine recordings of ‘The Year 1905’, both of which demand space on your shelf or hard drive. Admittedly, my allegiance to Wigglesworth has been sorely tested, by Bychkov especially, but it’s still intact. Indeed, that performance has an implacable rightness about it, which, coupled with unrivalled engineering, makes it my first choice. That said, these two brothers aren’t far behind.